This is the fourth grander for the famous boat, HUNTRESS, a 42-foot Merritt. Capt. 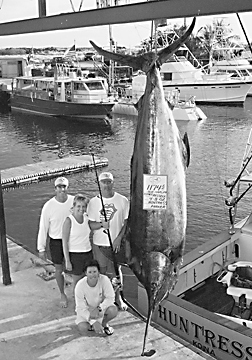 Randy Parker was at her helm when this 1174-lb blue marlin ate a lure running on a 130-class outfit and Jeffrey Russell heeded the reel's call. Crewman Boy Decoito was on hand to secure the fish. The HUNTRESS was previously named the BLACK BART and this is the second time the boat has caught two granders inside a year's time.